Perfect for all applications that require strong UVA of electro-magnetic radiation. Designed for gel & UV topcoat curing. 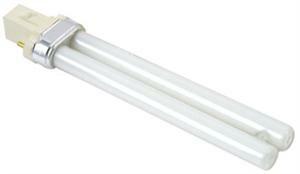 Replacement bulb for most of UV light units of 18, 27, 36, 45 watts / G23-Base. This replacement bulbs is for Magnetic Ballast UV lamp. * UV lamp weighs about 2.5lbs or less == electronic ballast.